The efficacy of homoeopthic medicines should be brought into lime light. The doubts raised by other school of medicines about homoeopathy must be replied with evidence & clarity must be maintained. We published some work in Journal of American Institute of Homoeopathy in March,1977 while I was working in AIIMS, New Delhi but further we could not proceed due to lack of facilities/encouragements. Hope if we can do some evidence based work for the progress of our system. It was a pleasure to have conversation with you, and revival of some old memories. 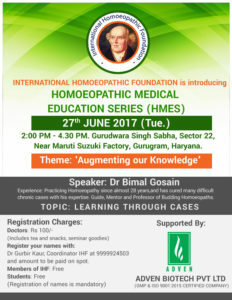 It is nice that the International Homoeopathic Foundation is such forum that shall enable us to bond once again. It is important that all of us, who have gone through the transition phase of the official recognition have also a responsibility also make all out efforts to take it forwards. Going through the History of Struggle for Homoeopathy, it is a well-known fact that more and more acceptance of Homoeopathy, more resistance it is going to face by the other lobby backed by the Pharmaceutical lobby. You are right when you say that our teachings have got to be fully supported with the practical support of the Laboratory, and all other diagnostic tools available from time to time. 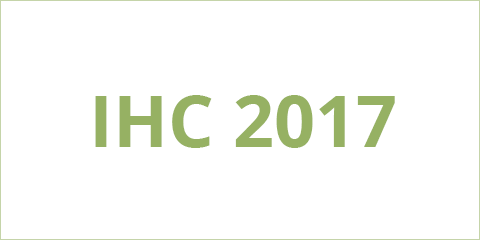 I would like to mention here that we organized an International Homoeopathic Congress, in April, 2016, with entire focus on academics, for which the theme was “EXPANDING THE HORIZONS OF HOMOEOPATHY”. The papers presented were evidence based, and appreciated by all participants. THE DEDICATION OF PERSONS LIKE YOU WOULD BE OF DEFINITE HELP IN THIS MISSION. I would appreciate your active involvement in this mission, not only of you but your other contacts as well. Not only that you yourself join the International Homoeopathic Foundation, but also motivate others to join and be a part of this movement. Please go to the site http://www.ihfworld.org, and spread this message not only to the professionals, but also to the consumers, as they are the persons who need awareness about this holistic system of medicine. It would always be my pleasure to exchange our views and try to plan a long term strategy. I fully agree with the need for evidence based research. This should be done by experienced clinicians who have plenty of amazing results in their practice. These should be published in their actual form with total transparency about dose and repetition. This will make the results reproducible for newer homeopaths. Also the science must keep abreast with today’s treatment methods and diagnosis. Pre and post treatment investigations should be encouraged and conducted. We must corroborate our cases with irrefutable evidence.